Paralympic Rugby, the toughest sport in the Paralympic Games? Chuck Aoki was just named to his 2nd U.S. Paralympic Team. 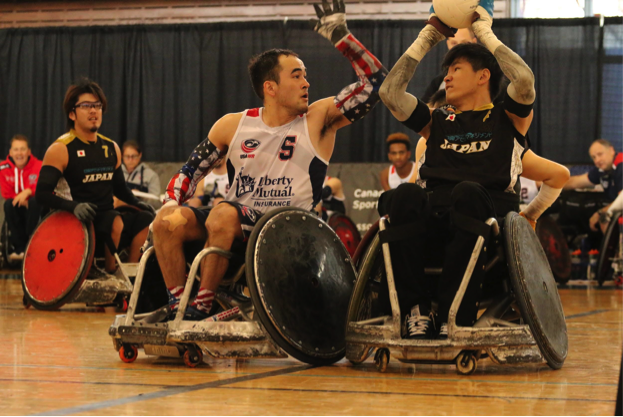 As the U.S. Paralympic Team prepares to take the court, we caught up with Chuck to learn a little more about what makes paralympic rugby so special. Just like their able-bodied counterparts, paralympic rugby is physically one of the toughest sports out there. In the year leading up to Rio, Chuck has encouraged his teammates to apply and work with Adecco and the U.S. Olympic Committee through the Athlete Career and Education (ACE) program. Chuck is returning to Rio after taking a bronze medal for Team USA in the 2012 Paralympic Games. Throughout his career, Chuck has been awarded various accolades including being named “Best 3.0” by the International Wheelchair Rugby Federation. Chuck has been on the U.S. National Team since 2009 and has become a stable leader for the team to rely on. Let’s learn a little more about paralympic rugby! How did you get into wheelchair rugby and what position do you play? I saw the movie “Murderball“, which is a documentary about the 2004 U.S. Paralympic Team. I loved the hard-hitting nature of the sport and instantly wanted to get involved. I found a local team here in Minnesota, and have been playing ever since. I am what is called a “high-pointer”. In wheelchair rugby, each player receives a sport class, ranging from 0.5 to 3.5. I am a 3.0, and I am one of the higher functioning players on the team. I do a lot of the ball handling, scoring, helping to defend the other team’s top threat. What do you think would surprise a viewer most when watching this sport? What would surprise the average viewer about our sport is just how physical it is! The sound of two wheelchairs, which easily weigh over 40 lbs, ramming into each other, is quite loud and most new viewers are often shocked at the sound! Athletes using their wheelchairs to knock each other over is something people have to get used to. I’ve sat in one of those chairs and tried to move around while handling the ball and it’s exceptionally difficult to multi-task! So, what makes a good wheelchair rugby athlete? Beyond just physical fitness, strength and endurance; the true mark of an elite rugby player is their mind. At the top level, everyone is fast. You’ve got to be able to think faster than your opponent. What’s different about the wheelchair you use while playing vs. the one you use in everyday life? My rugby chair is more than double the weight of my everyday chair, and is like a small tank. The rugby chair is pretty much only useful for rugby. You’ve competed in the Paralympic Games before. What is going to make this one special, and what are your goals going into it? Now I know what the Paralympics are all about. I can focus on competition more, as I know exactly what to expect. Our goal is to win a gold medal. Beyond that, there’s really not much else to say! Since a gold medal is the goal, who is going to be your stiffest competition to get the win? There are genuinely 5 teams that could win gold, and two more who could spring upsets. Australia is the defending gold medalist from London. Canada’s team always battles us to the end. This will be the most competitive Paralympics ever. We have a phenomenal team and even with the competition, I think we can win. Do you think you will see a lasting effect from participating in the ACE program? I will definitely see the lasting effects of participating in the ACE program. Working with the sponsor company has benefited both me and my store. I certainly think it’s the same across the country. I do really enjoy working there, and plan to continue after the Games. Chuck Aoki has been a wonderful addition to the ACE Program. He has worked hard and will be a key contributor to Team USA as they prepare to compete at the Paralympic Games! Paralympic Rugby kicks off September 14th in Rio!